We had a really great turn out. One fella drove from Arkansas in his Chevy Volt. Very cool. Some new cars we had the privileged to see were the all new Toyota Prius Prime (Thank you Kai), A 2018 plug-in Hybrid Mini Cooper Countryman (Thank you Roadshow MINI). The weather was great and the park was packed so we had more folks than we could count that checked out all the electric cars, asked questions, and listened to all the cool stories EV owners had to share about driving electric. Thank you Shelby Farms Park for hosting us this year. Thank you Roadshow BMW and Roadshow MINI for providing the BMW i3 and the plug-in hybrid Mini Cooper Countryman. Thank you to all the EV owners for bringing your cars and being a part of this event. 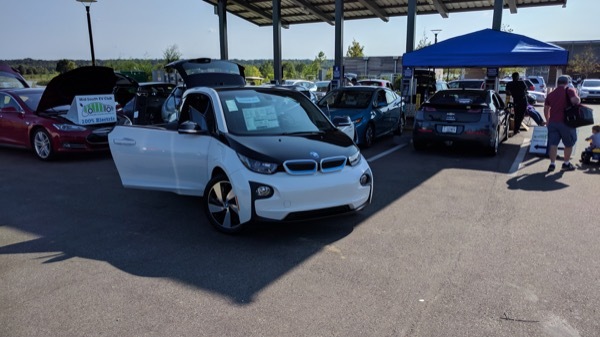 The event, part of “National Drive Electric Week,” will be Saturday, September 9th at Shelby Farms Park in and around the EV charging stations under the solar panels from 2 to 6 pm. Around the country, "National Drive Electric Week", is sponsored by the Sierra Club, Plug In America, the Electric Auto Association and local advocates like the Mid-South EV Club. The exclusive automotive sponsor is the Nissan LEAF. Rallies are being held in hundreds of locations around the country. Owners of electric cars will be on hand to show their cars, and share their electric car ownership experiences. Sign up as soon as you can even if you think you can only hang out for a short while. This well help us plan better for the event. It only takes a few seconds and there's also a short survey for a chance to win $250. Please note, there will be only 7 charging spots reserved for the club for those that want to show their EVs. Otherwise, you'll need to park in a regular (non-reserved) parking spot nearby if available. We'll do everything we can to make sure anyone that wants to show their EV; can do so. Registered attendees report 350,438 electric miles driven.